Eighty percent of American women experience common symptoms while going through the two-to-ten–year perimenopausal and menopausal transition. 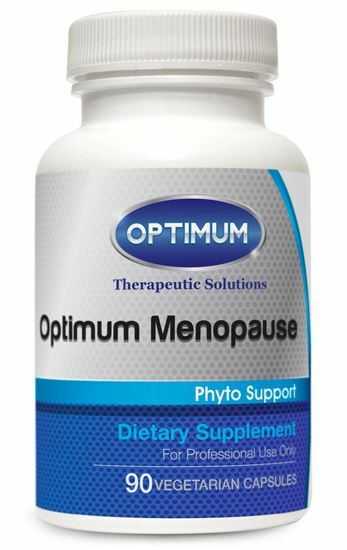 Optimum Menopause addresses a broad spectrum of normal menopausal complaints, making it an attractive option in varied clinical settings. Black Cohosh (Cimicifuga racemosa) is an herb American Indians used for gynecological support, including relief from common, normal menstrual symptoms such as cramps and related low-back discomfort. Research shows that black cohosh effectively maintains a sense of calmness and healthy outlook, and it may help address menopause-associated vasomotor symptoms. According to the medical literature, black cohosh is beneficial to vaginal superficial cells and bone health without having a potentially detrimental effect upon the endometrium or follicle-stimulating hormone (FSH) levels. According to Ruhlen et al., black cohosh may exert its benefits through selective estrogen receptor modulation, serotonergic pathways, antioxidant activity, or inflammatory pathways. Dong Quai (Angelica sinensis) has its origins in China, Japan, and Korea, where it is used to balance the female cycle. Dong Quai works best in combination with other herbs to support menstrual regularity. Dong Quai can nourish dry, thin vaginal tissues. Licorice (Glycyrrhiza glabra) functions as a weak phytoestrogen and has been reputed to aid in sexual arousal. Research suggests that glabridin, an isoflavone in licorice, is an estrogen-receptor agonist and supports normal breast cell growth. Licorice has been shown to have potential for supporting healthy bone mineral density in postmenopausal women and for inhibiting serotonin re-uptake. It is used for liver and adrenal support, the latter being important as ovarian estrogen synthesis declines. Chasteberry (Vitex agnus-castus) supports symptomatic relief of common perimenopausal and menopausal symptoms. It appears to significantly compete for binding at the estrogen receptors. Chasteberry has normalized short luteal phases and progesterone synthesis. The popular herb may help relieve the common, transient symptom of mild breast tenderness possibly by inhibiting prolactin secretion. Chasteberry can help support a normal, healthy attitude during the perimenopausal transition. Wild Yam (Dioscorea villosa) has long been used to support female cycles and functions as a phytohormone. Red Clover (Trifolium pratense) is considered a phytoestrogen. Its contents include genestein and salicylic acid. While red clover is helpful in reducing flushing, it does not increase breast density or raise estradiol levels. This herb has shown a positive effect on vaginal cytology and can help maintain a healthy cellular response to hormone-induced discomfort in urinary tract tissues. Scientific evidence suggests that red clover can also support healthy blood lipids and bone health. Dandelion Root (Taraxacum officinale) has been commonly used for its ability to help maintain healthy fluid balance and for its cleansing effects. In vitro research suggests that the active constituents in dandelion—which include luteolin, quercetin, and inulin—suppress COX-2 and inducible nitric oxide synthase, increase antioxidant activity, upregulate phase II detoxification, and support bifidobacteria growth. Motherwort (Leonurus cardiaca) is a phytoestrogen especially helpful for maintaining an even heartbeat, a normal body temperature, and a healthy menstrual cycle. It has long been used to support the body’s healthy response to pain, maintain healthy muscle function, and provide physical and emotional comfort and stability. Ashwagandha (Withania somnifera) Within the system of Ayurveda, ashwagandha is classified as a rasayana (rejuvenation) and is expected to promote physical and mental health, help rejuvenate the body, and increase longevity.